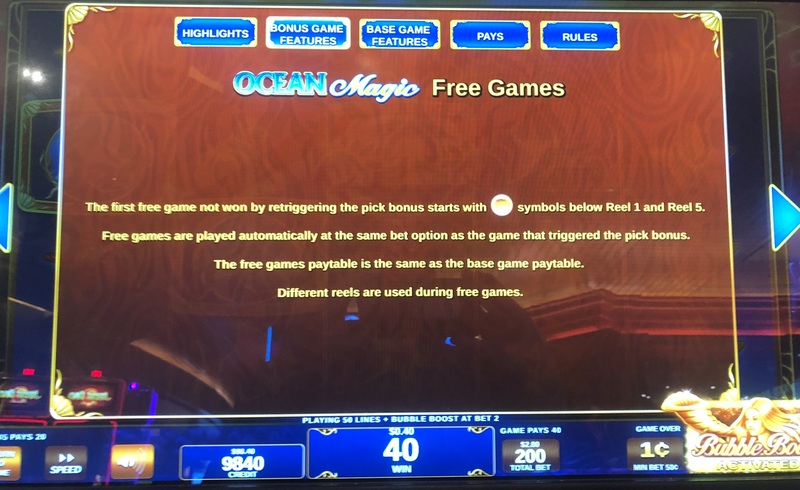 Ocean Magic is what some would call a "variable state" slot machine by maker IGT. 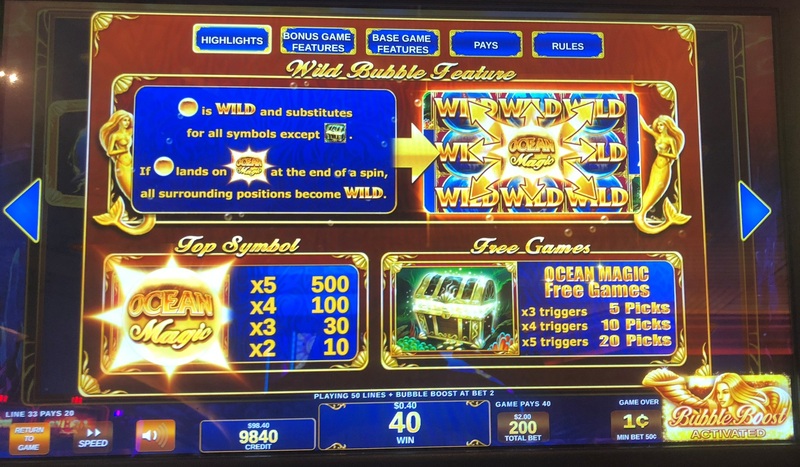 It is characterized by wild bubbles that move up one row after each play. If it is only played when the previous player abandons bubbles in good positions, it can result in a player advantage. Following are the significant rules of Ocean Magic. There are two modes the game the player choose from -- Wild Bubble and Bubble Burst. The pay table for both modes is shown below. 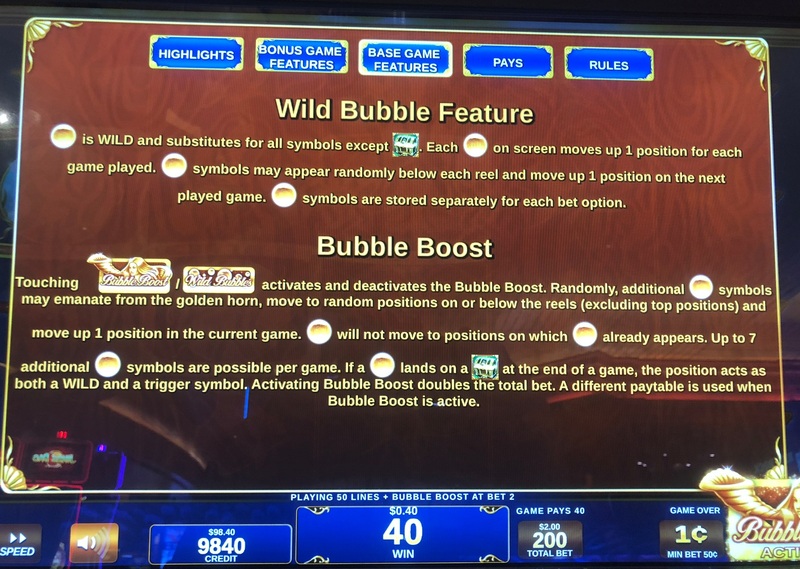 While there are no wild symbols on the reel strips, wild bubbles will randomly bubble up from the bottom of the screen after each bet. All wilds may substitute for any symbol except the scatter. If the player looks carefully, he can see the top of any bubbles below the bottom row, ready to bubble up the next spin. A bubble will replace whatever symbol would otherwise be there, according to the reel strips. However, if a bubble replaces the scatter symbol, the player will still get credit for the scatter, as well as the bubble. If there is a bubble already on the screen, it will move up one row after each bet. If a bubble is on the top row, it will float off the screen on the next spin. If a bubble lands on the Logo symbol, then it will expand and all positions one away, horizontally, vertically, and diagonally, will become wild. However, the wild expansion will not be bubbles. In other words, wilds as a result of an expansion do not bubble up on the next spin. As with bubbles, if a wild expansion occurs on a scatter symbol, that position will serve both as a wild and a scatter pay. If a bubble lands on a Logo next to an edge or corner of the screen, then the expansion will take place in those directions still on the screen only. In other words, an expansion will results in 8 extra wilds if it occurs in the middle six positions on the screen, five positions if on an edge, and three positions if in a corner. If the player gets three or more scattered Treasure Chest symbols, then he will play the bonus game. 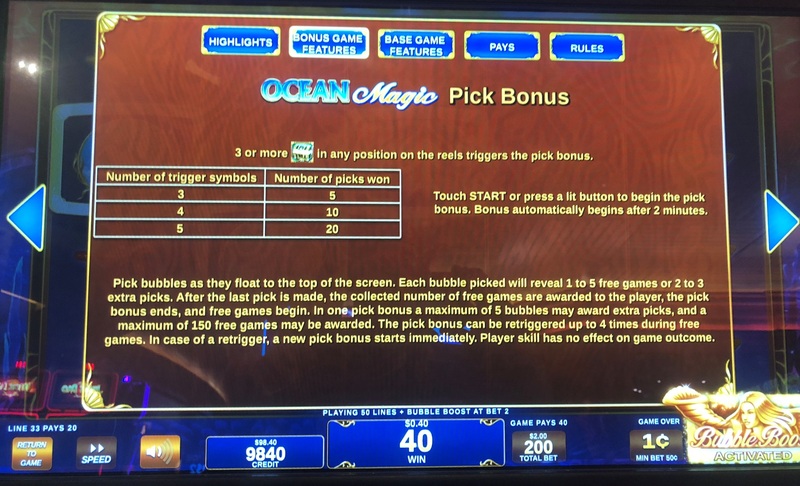 In the first stage of the bonus game, bubbles will float up on the screen and the player will pick 5, 10, or 20 of them, according to whether the bonus was triggered with 3, 4, or 5 scatters, respectively. Each bubble will reveal either 1 to 5 free games or 2 to 3 extra picks. In the second stage of the bonus, the player will get the number of free spins determined in the first step of the bonus. Bonus spins can re-trigger the bonus, adding more free spins to the number remaining. The maximum number of free games that can be won is 150. Free games use a separate set of reel strips. If the player doubles his bet, then he will play in Bubble Burst mode. 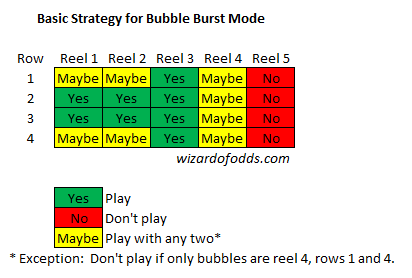 Wins in Bubble Burst mode are based on only half of the total bet and are applied to a lower pay table than Wild Bubble mode. The other half of the bet is a non-refundable fee to enable the Bubble Burst. In Bubble Burst mode, randomly extra bubbles will be placed on the screen. The industry term for this kind of feature is an "exploding wild." As with bubbles that bubble up from the bottom, bubbles resulting from the Bubble Burst mode will bubble up one row after each spin. It is standard in the industry that if the player pays a fee to invoke a special feature, the overall return of the game with the feature activated is greater than without it. As mentioned in the introduction, Ocean Magic is a variable-state game. If the last bet resulted in bubbles on the bottom three rows or below the bottom row, then the game will be in a higher state than with no guaranteed bubbles. With bubbles in the right places, the game can result in a player advantage. The astute player should start playing only in a positive state and quit as soon as the game is in a negative state. 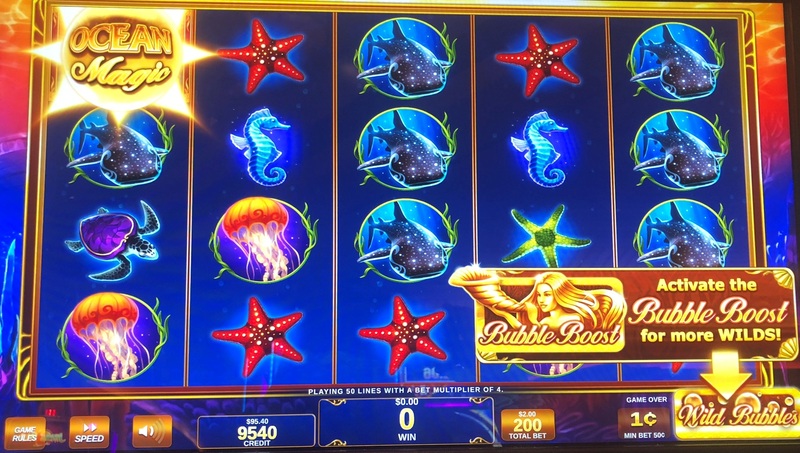 As with most slot machines, Ocean Magic was difficult to analyze because I didn't know the reel stripping, the probability of a bubble floating up from the bottom, the probability of a Bubble Burst and number of bubbles in the burst, and possibly other factors. In lieu of that information, I did the best I could based on observing the game and industry norms. The game was simply too complicated to analyze by direct math, so I wrote a random simulation, for both Wild Bubble and Bubble Burst modes. 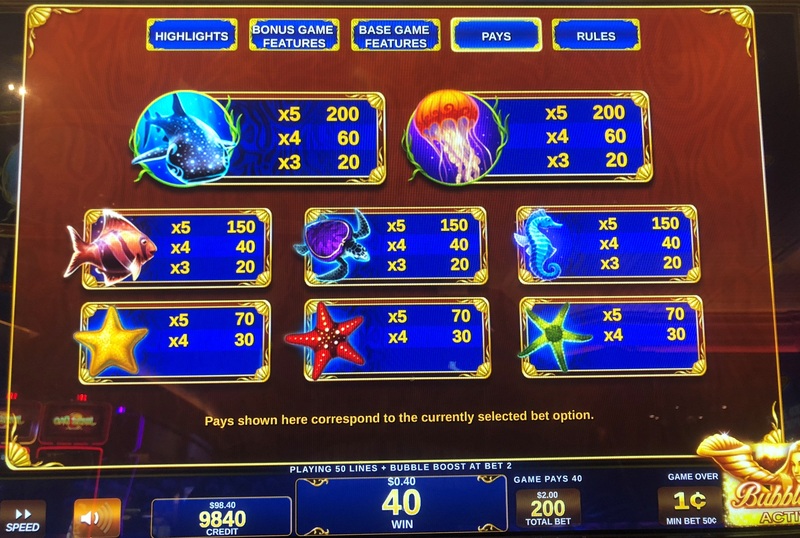 I set the simulation to a return of 85% to 86%, which is how many casinos nationwide set their video slots, as well as erring on the side of being conservative in showing the value of this game. Following are my results in both modes. I know that there are wild bubbles in both modes, but the lower right corner of the screen identifies the two modes as Wild Bubble or Bubble Burst, so I will stick with that terminology. That said, the following table shows when you should play according to where a wild bubble(s) will be on the NEXT SPIN. Play with any bubble in a "yes" space or any two in the "maybe" spaces, except the only maybes are in reel 4 rows 1 and 4. Some on my forum have disagreed with me about playing with a bubble in the upper-left corner or in the middle of reel 4. I think these disagreements are from players who usually play in Bubble Burst mode, where one additional bubble is not as significant. Remember, the line pays are twice as much in Wild Bubble Mode, compared to Bubble Burst, relative to the amount bet. That makes a single bubble roughly twice as valuable. In Bubble Burst Mode the wins are cut in half (relative to the total amount bet) in exchange for more bubbles. That makes any one bubble less significant, given the same location on the screen. 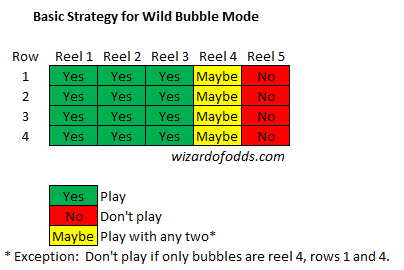 The following table shows when you should play according to where a wild bubble(s) will be on the NEXT SPIN. Play with any bubble in a "yes" space or any two in the "maybe" spaces, except the only maybes are in reel 4 rows 1 and 4. 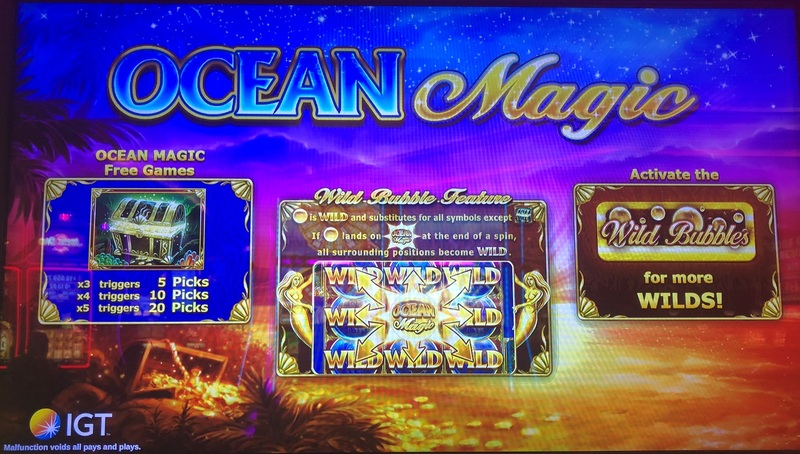 Ocean Magic — Lively and at times heated discussion about advantage play and Ocean Magic in my forum at Wizard of Vegas. YouTube video of me playing Ocean Magic, for the purpose of gathering data. 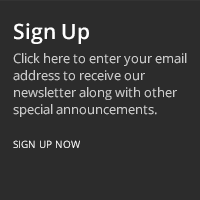 ONE WEEK, ONE MILLION DOLLARS: ADVANTAGE PLAYERS FIGHTING FOR THEIR WINNINGS AT NJ ONLINE CASINOS — Article at NJ Online Gambling about how players beat Atlantic City online casinos for $900,000 playing Ocean Magic, using the same kind of strategy here.